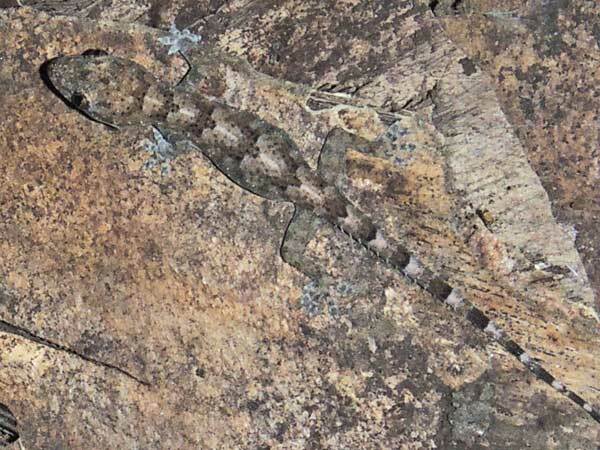 This small gecko was hunting at night on an exposed boulder not far from habitations and lights attracting insects. Kisumu at Lake Victoria, Kenya, October 2016. Several species of small geckos, known as House Geckos collectively, are likely to be found hunting insects in and around human dwellings. Electric lights have been a boon to their success and because they also eat insects that are an annoyance to people they are well tolerated, even encouraged. Geckos have an extraordinary ability to walk upon verticle surfaces by means of highly specialized pads on the toes of their feet. Copyright Michael J. Plagens, page created 12 June 2017.